Meathead Movers is here to take care of the heavy lifting for you on your move to Livermore. Our clean-cut student athlete movers are ready to get you safely settled into your new Livermore home. Welcome to Meathead Movers of Livermore! If you are moving to, from, or within, Livermore, we are the moving company for you! Our professionally trained student-athlete movers and our move concierge are here to help you with every stage of your move in Livermore. From its sprawling hills and gorgeous wineries, to its expansive farm lands and ranches, Livermore offers a certain rustic charm while still managing to be a flourishing and innovative city. As California’s oldest wine region, Livermore has a number of award-winning wineries. The city’s abundance of open lands and parks gives its residents and visitors plenty of opportunities for outdoor recreation. Sycamore Grove and Lake Del Valle are two gorgeous parks for people who enjoy hiking, biking, horseback riding, and even boating. Robertson Park is also a great park for outdoor recreation in Livermore. With multiple soccer fields, a dog park, and even a riding and stadium area, this park is a popular place to play for Livermore residents. Robertson Park even hosts the Livermore Rodeo, which just happens to be the World’s Fastest Rodeo and attracts hundreds of people from all over California each year. The city is also a cutting-edge leader in science with both Lawrence Livermore National Laboratory and Sandia National Laboratory. These labs draw in some of the brightest minds in the area and are huge employers for the city. 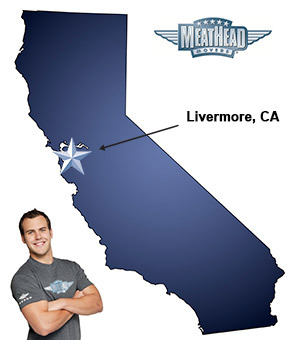 If you are considering calling Livermore your next home, Meathead Movers is here to help. Our moving company specializes in local, long distance, and commercial moves to, from and within Livermore. We also provide reliable packing, storage, on-site relocations, and our distinctive concierge service. All our student-athlete movers are thoroughly screened and trained before their first move. With branches not just in Livermore, but all throughout California, we are your one-stop resource for all your moving needs, no matter where your California move takes you. In fact, you can see what your neighbors in Livermore have to say about us! Contact Meathead Movers today for a free moving quote and learn how we can help you on your next move. With our 100% satisfaction guarantee, the only thing you have to lose is the stress that comes from moving! Moving to Livermore? Here are some helpful resources. Efficient, friendly, honest. No hidden costs. Showed up to load and deliver on time just as promised. You overcharged us, the entire reason we hired you , you agreed to do but when your people came they would NOT DO it, $629 FOR NOTHING. What a SCAM!! Friendly and careful movers. We did't have anything break or damaged in the move.